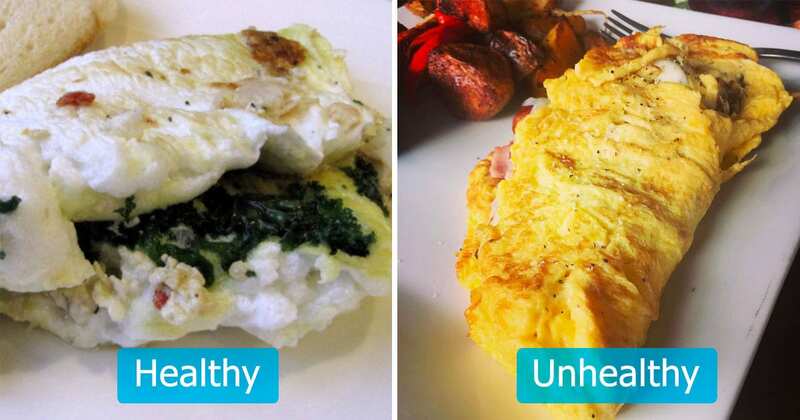 We are all familiar with what our food looks like on the shelves of the grocery store and prepared on our tables, but what about before that? Since the first food store opened, the Piggly Wiggly in 1916, people have become ever more reliant on trips to the grocery store to fulfill all their family’s food needs. 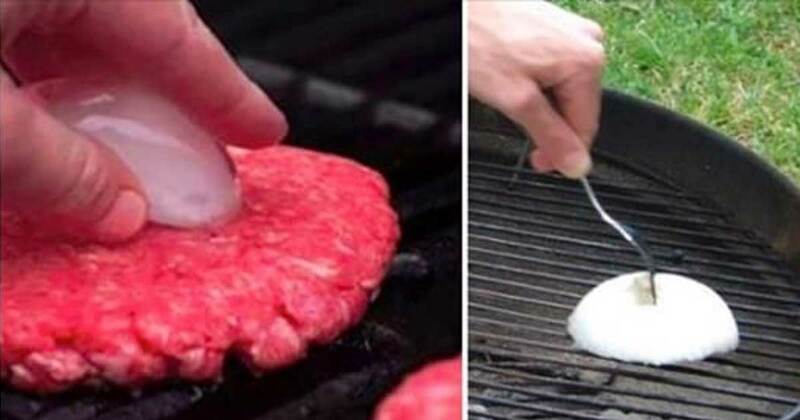 As a result, some of us have lost touch with what our food looks like as it’s growing. Most of us know that apples and pears grow on trees and grapes grow on a vine. There are some foods, though, that looks downright out of this world before it hits the store shelf! Food that seems basic to us in the grocery store looks foreign and exotic when it’s growing on its own or being cultivated by a farmer. 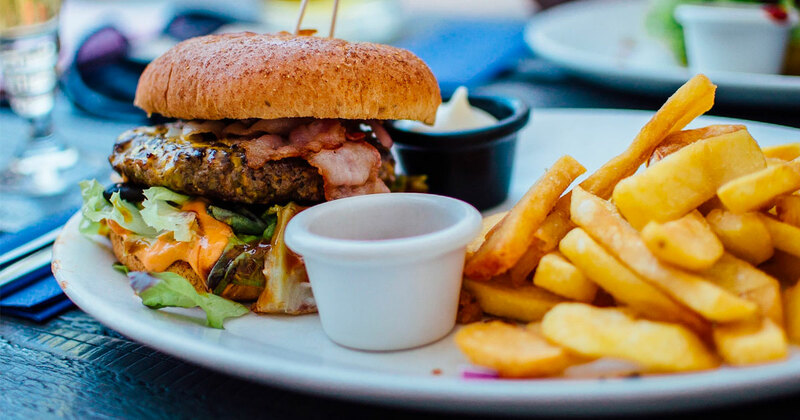 Some of these foods are more common than you think. For instance, have you ever wondered where tapioca comes from, or what a pineapple “tree” looks like? And what about chocolate?! We are familiar with so many delicious foods when we’re staring at it in a package or a bin at the market, but more often than not, you wouldn’t know those same foods if you were face to face with them in nature. 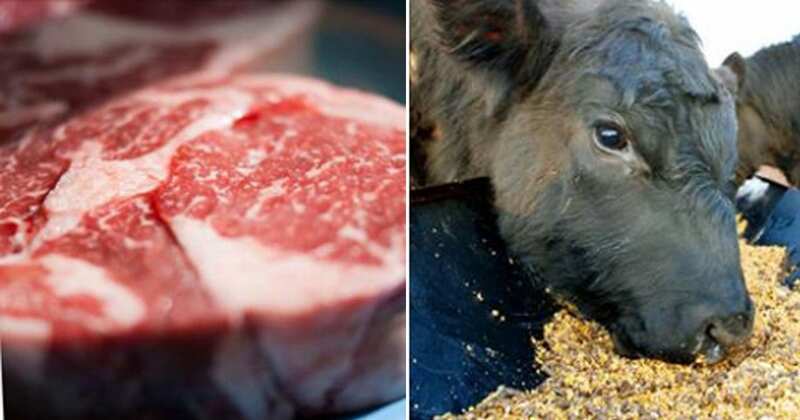 Here are over 30 photos that will prove this theory, and blow your mind with how our food is actually grown! Passion fruit has recently seen a surge in production after being deemed a superfruit, rich in immune-boosting vitamins as well as iron, riboflavin, and niacin. It is popular in beverages and smoothies, but would you know it if you saw it? 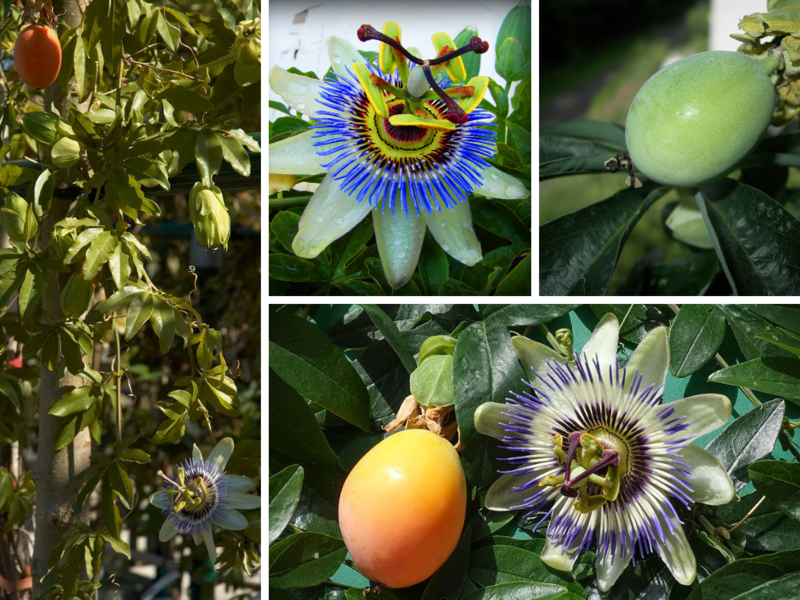 It comes from a downright alien-looking flower and contrary to popular belief, it doesn’t grow on trees, but on a vine. It will quickly take over any nearby trellises or buildings in a cascade of leaves and showy flowers. 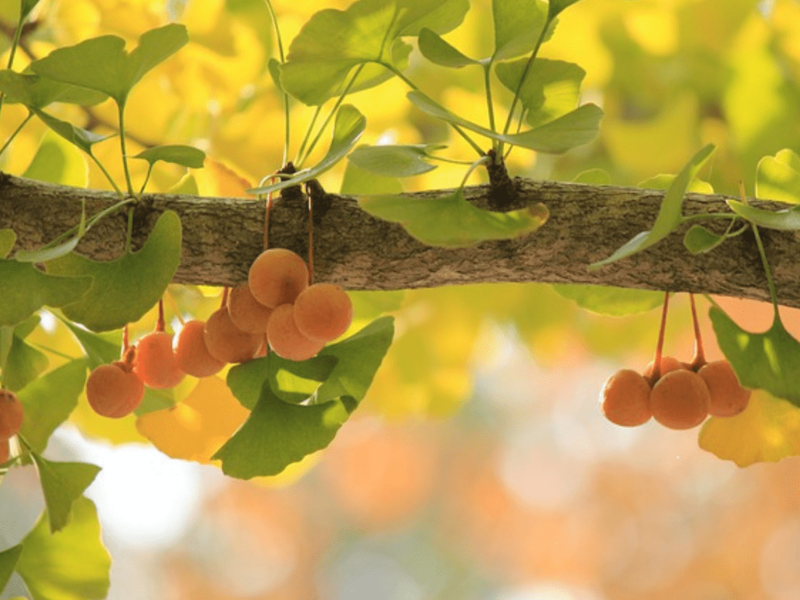 These super-sweet fruits are known as Nature’s candy! They grow in the desert near oases on date-palm trees, and can grow to be over 75 feet tall! These large lovelies produce enormous amounts of fruit each season, but not before it’s ready. 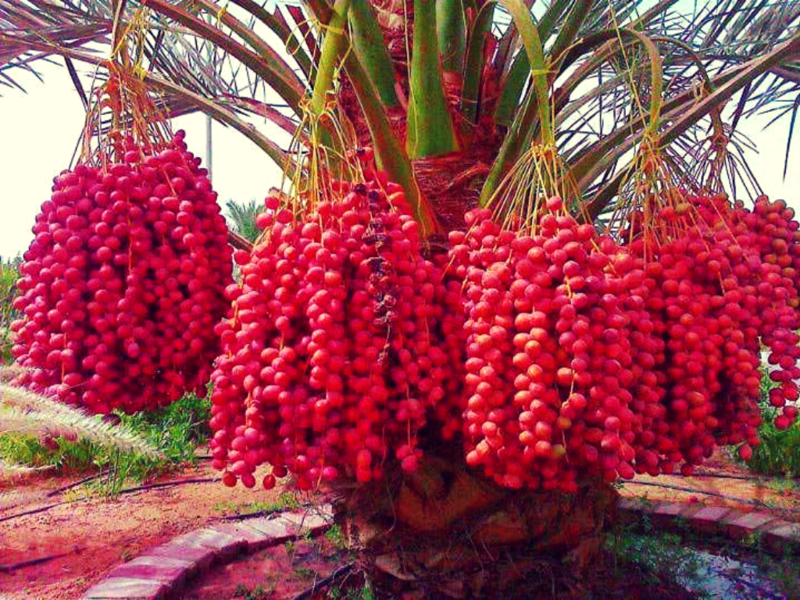 It can take up to 8 years for a date-palm to reach maturity and begin fruiting, and up to 10 years for them to produce abundant harvests. 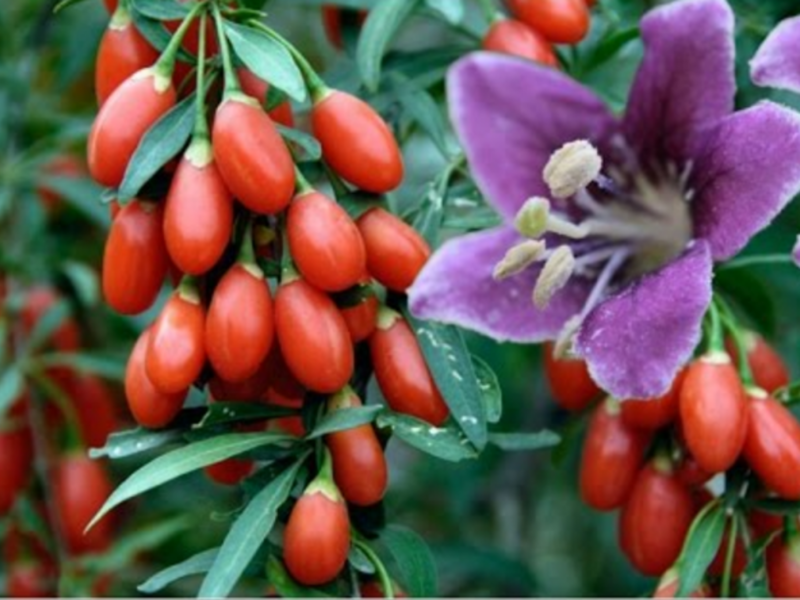 Yet another superfruit common in the grocery stores and bulk sections is the Goji berry. With the amount of protein, fiber and important minerals they pack per serving, they’re downright medicinal. Some studies have even shown that they outperform most other berries in terms of nutritional benefits, and can even help kill cancer. Like with most healthy foods, they don’t come cheap, so learning how to cultivate these vines with their sweet little berries would be well worth your effort! We’ve seen this invaluable plant marketed in supplemental powders, tablets, and extracts for years now. That being said, many people thought the medicinal part of this plant responsible for all of its brain-boosting effects came from the fruit, but nope! It’s actually the leaf that gets extracted and turned into the memory power-drug we’ve all come to know and love. Fall is here everybody, and that means sweets, treats, and delicious eats! It also means the grocery stores will soon be overflowing with vanilla extracts to go into all those yummy goodies. A lot of people know that vanilla comes from a bean (Hello, vanilla bean ice cream! ), but they don’t know a lot more about it than that. 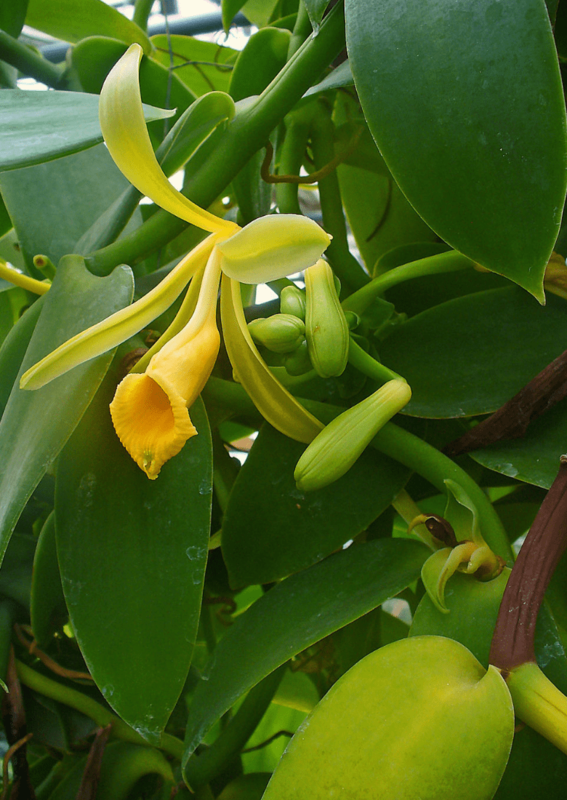 Like, for instance, the vanilla bean grows from a small, beautiful orchid floating amongst a sea of waxy dark-green leaves on a vine. Bonus; just putting one or two of these whole vanilla pods into a 5 lb bag of sugar will give you all the vanilla flavoring you could ever want and take your baked goods to the next level! The big tropical Papaya fruits we see in the produce section at the grocery stores look like they would come from a jungle vine, but actually, they grow on large plants that look similar to palm trees. 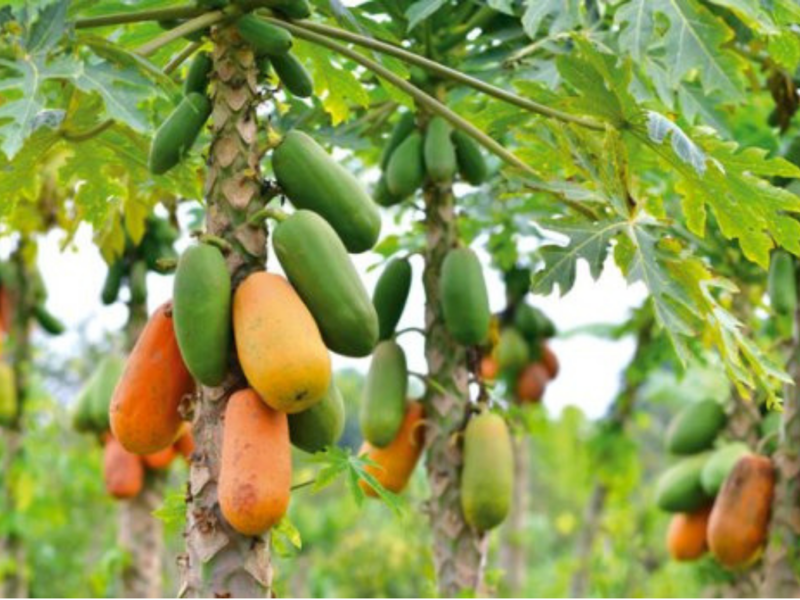 Unlike other fruits that hang from branches, papaya fruit grows right out of the side of the tree, while its fronds grow above the trunk and provide canopy. If you live in the right climate, they grow relatively fast (about 10 months) and are heavy producers. If you live in the tropics, you can enjoy this fruit right out of your backyard year-round! Cashews are one of the most favored nuts in America. Almost everyone is familiar with their kidney-shaped structure and their delicious mellow flavor, but this nut is actually a seed. 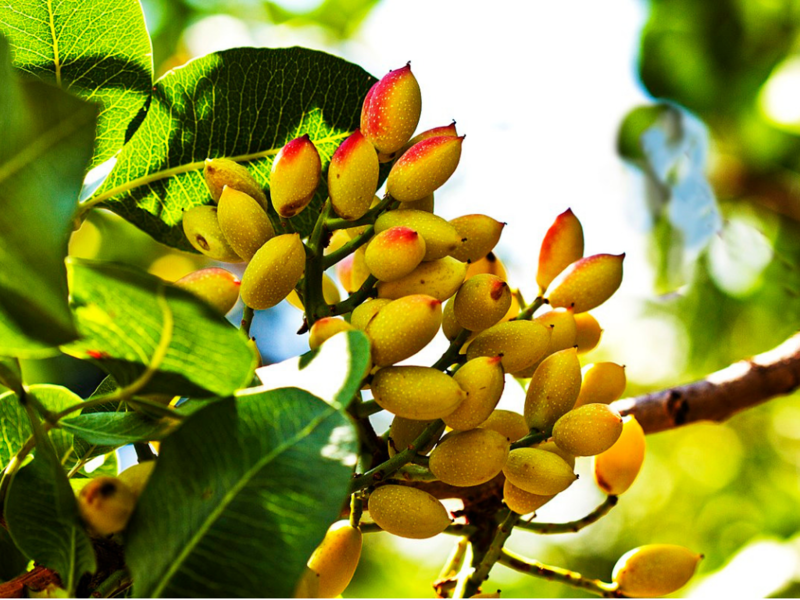 Cashew trees can grow to be nearly 50 feet tall with a fat, winding trunk and branches. 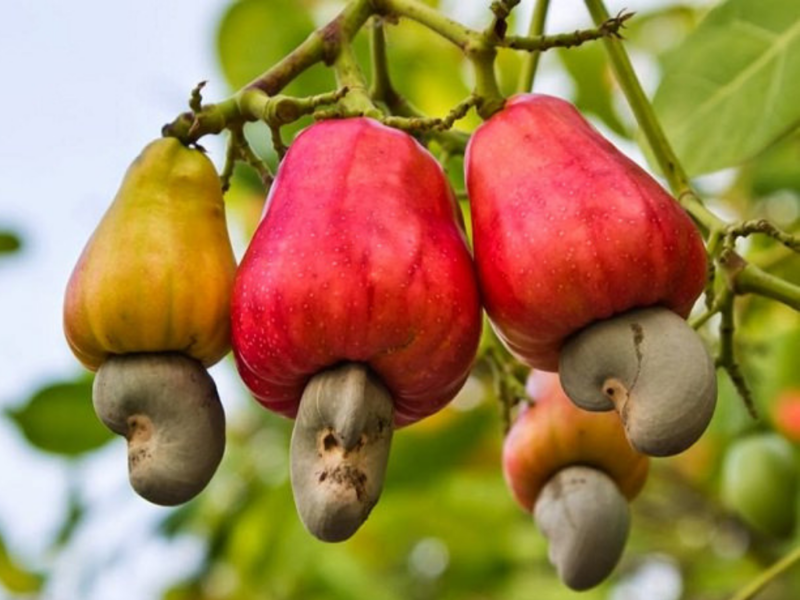 The largest cashew tree is in Brazil and stretches out over 81,000 square feet! 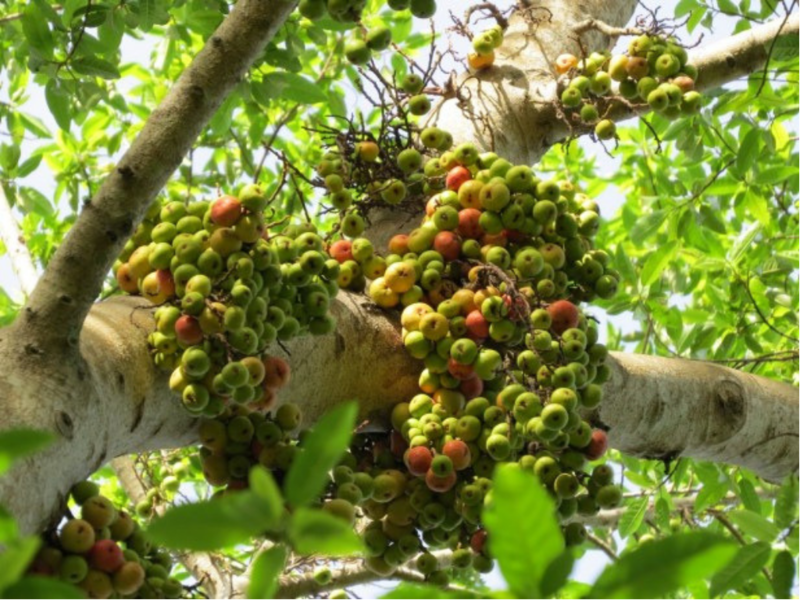 These trees produce “cashew apples” that are edible and can even be distilled into strong alcohol! Considered a false fruit, the apple’s bottom is attached to the cashew seed that is covered by a thick shell, which also has a lot of uses! This ancient spice has been used for over 3,000 years and has always fetched an extremely high price in the spice trade. That has everything to do with what it is and how it’s grown. 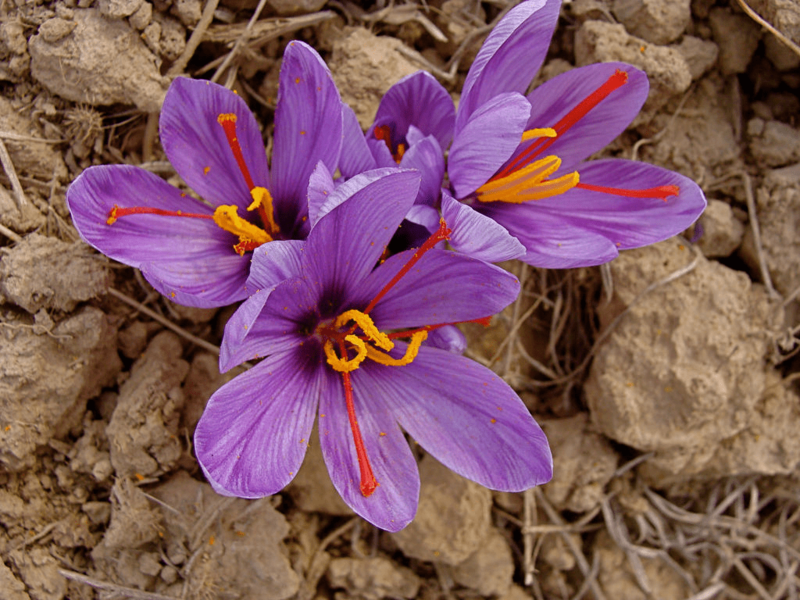 Saffron spice comes from a flowering crocus and is the dried red stigmas of the flower. Each flower only produces 3 stigmas that can only be hand-harvested for 7 days out of the year, making it one of the most valuable spices on Earth. Fortunately, you only need two or three of the stigmas to flavor an entire meal, so it’s worth the $15 for a gram. You may have always thought pineapple comes from a tropical fruit tree, but you’d only be right about the tropical fruit part. Pineapples actually grow out of a relatively low-lying plant and only reach about 3-5 ft in height. Each pineapple first starts as brilliant clusters of up to 200 flowers or more. 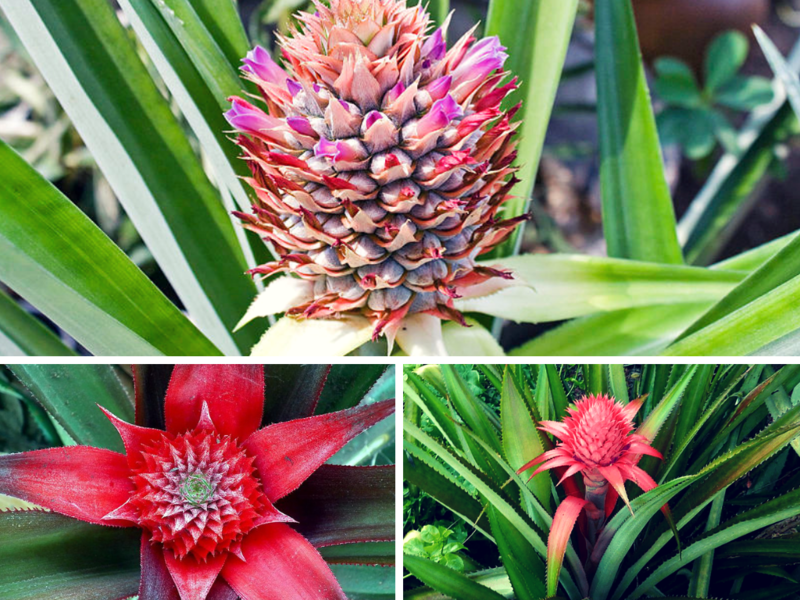 Over a couple of weeks, the flowers slowly form into fruits and merge together, creating the delicious pineapple we buy at the supermarket. Cinnamon is yet another spice that’s been counted as precious for thousands of years as a spice that really wakes our food up. Despite seeing loads of it, both powdered and curled into cinnamon sticks, many people aren’t aware of how it grows. The cinnamon we see in stores actually comes from the inner bark of a tree in the Cinnamomum family, of which there are many species. After about 2 seasons of growth, the tree branches are cut back to the ground where plenty of new ones will form. 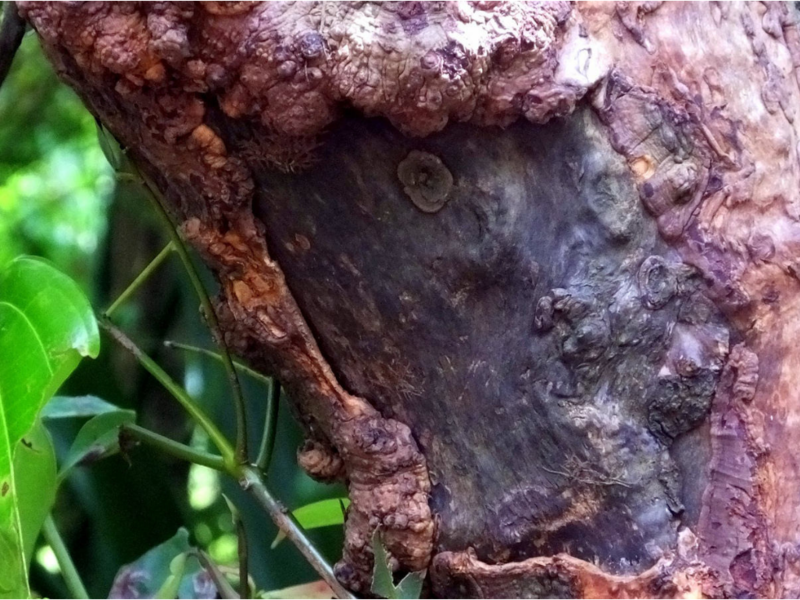 The outer-bark is then shaved away and the inner bark is beat with a hammer until it loosens and can be peeled away. It is then cut into the cinnamon sticks we see after it dries. If you’re a sushi lover, then you’re no stranger to wasabi. The popular spice is actually prepared using the ground root or tuber of the wasabi plant. Called Wasabia Japonica, these plants are native to Japan and grow rooted in river beds with their leaves held above water on long stems. 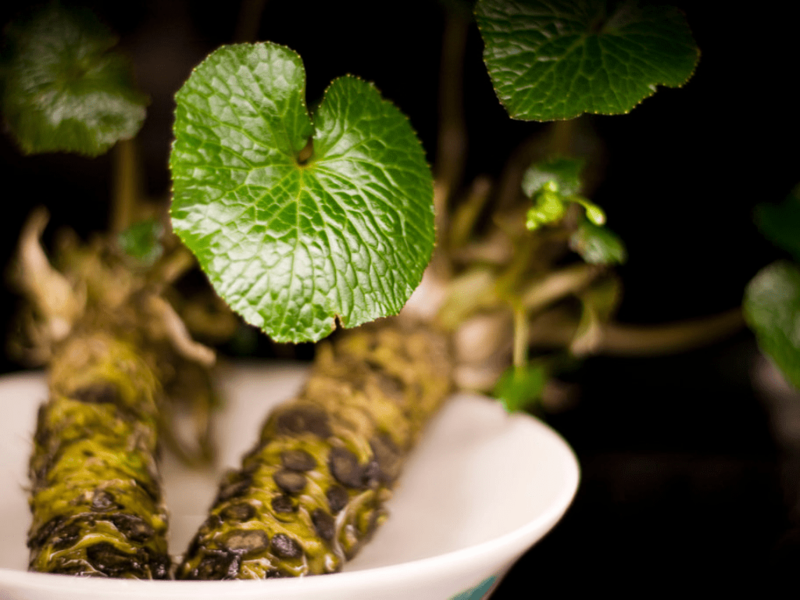 True wasabi has a more pungent flavor than the “wasabi” made from horseradish and mustard commonly sold in stores. It’s perfectly natural to assume that peanuts, like other “nuts”, grow on trees. They don’t, though. 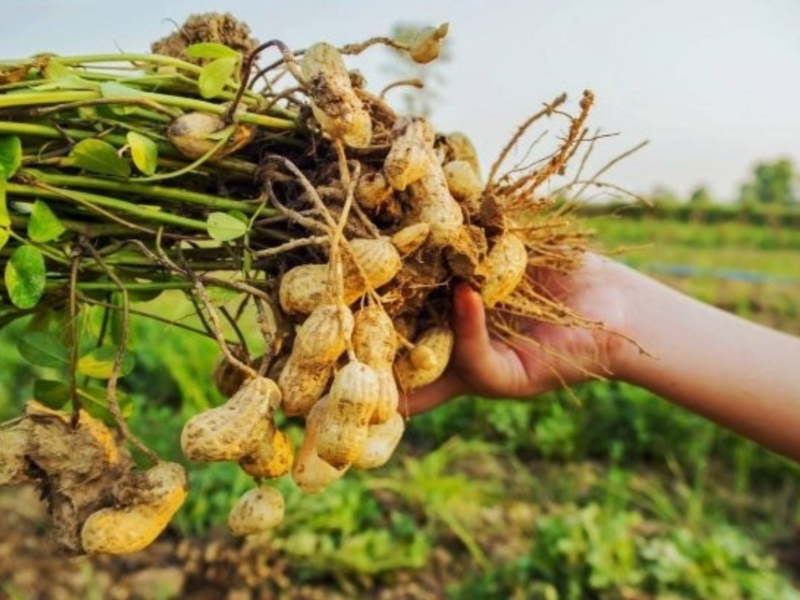 Peanuts are technically a legume and grow beneath the ground. The way a peanut grows is truly an odd thing. The plant grows leaves and the base of the plant produces a beautiful yellow flower. After the flower falls away, a “peg” is left and it slowly grows downward toward the soil as the peanut begins to form. They continue to grow outward horizontally until harvest. When you look at a fresh slice of kiwi, it’s hard not to imagine tropical fruit-laden trees in a jungle on the equator somewhere. We’ve got good news for you, though. These delicious, thin-skinned juicy sweet fruits actually grow on manageable vines, and they can probably grow in your area! 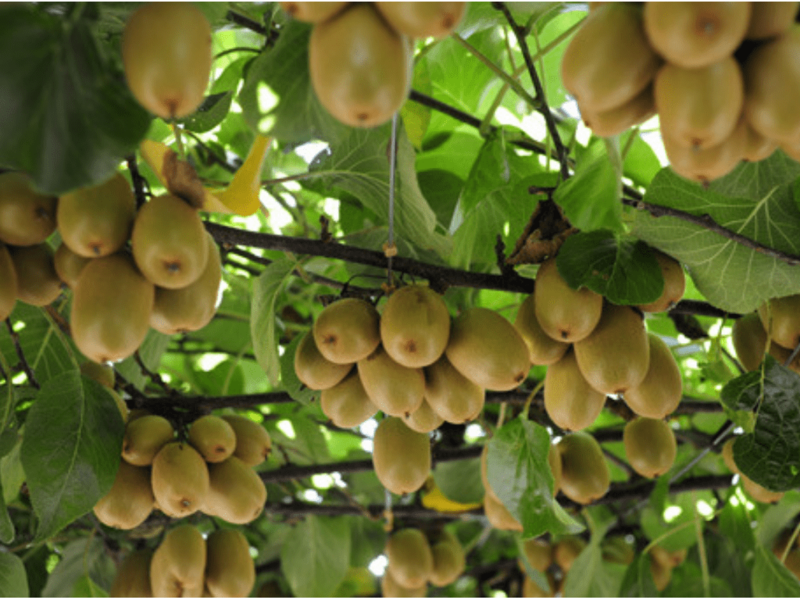 Kiwi vines can be trellised and trained to grow like grapes, and they are considered a good cold-hardy fruit option. Some species of kiwi can even withstand drops in temperature to -40°F, making this a special fruit indeed! Brussels sprouts look just like mini-cabbages, and for good reason. They are in the same family, known as the Brassica family. 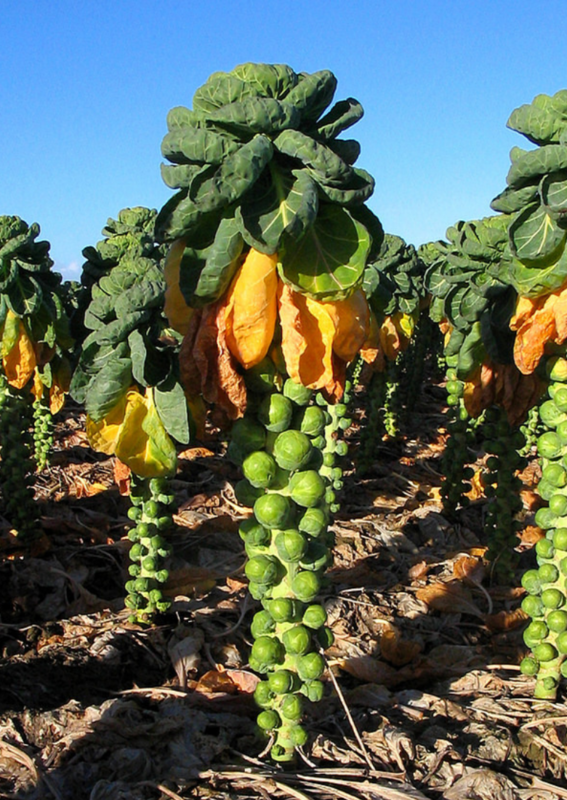 While you may be familiar with the way their gigantic green cabbage cousins grow like huge food globes nested in leaves, brussels sprouts grow in an entirely different fashion. Large leaves form from the sprouts as they shoot up to 3 feet in the air on a thick stalk. The small globes of the brussels sprouts then form in thick clusters that grow directly from the stock, making it a cold hardy and abundant veggie in the garden. This brain-shaped nut is common in baked goods or as a healthy salad or cereal topping. While you might be familiar with both the nut and the shell, many people wouldn’t know it if they were standing under a fresh cluster of them. 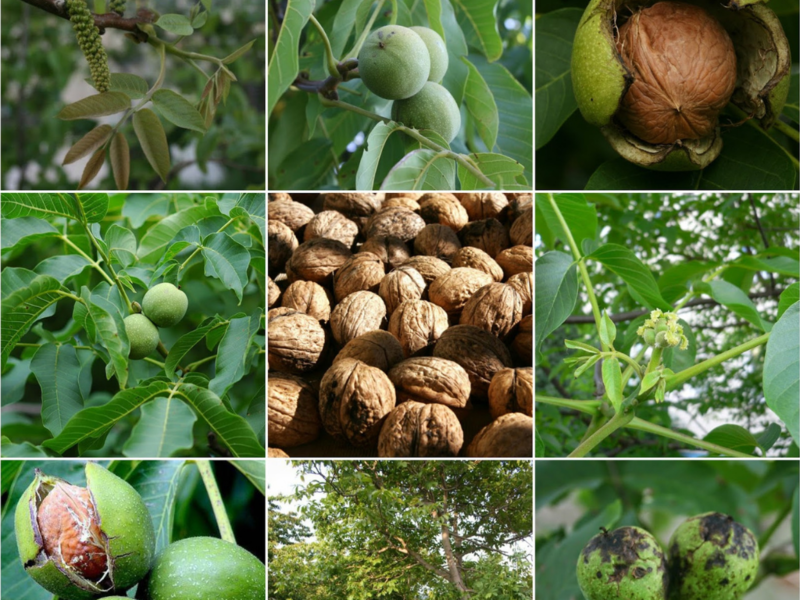 Walnuts are botanically considered to be a stone-fruit, like peaches and apricots. 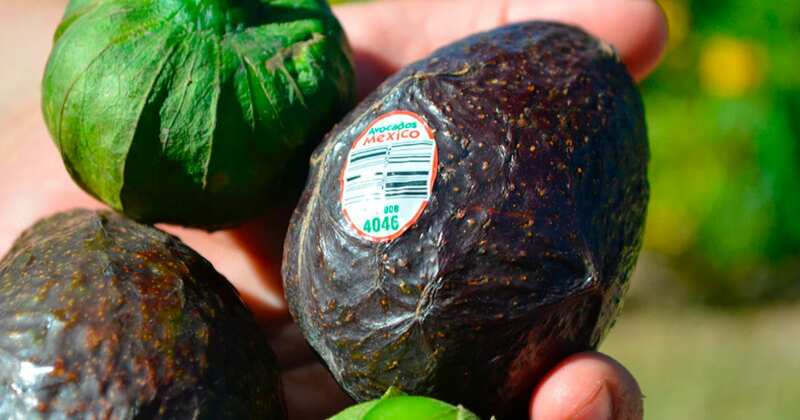 In culinary terms, though, the edible part of this fruit is the seed, which grows encased in a shell buried in an inedible yellow-green creamy-fleshed fruit. Figs are a fascinating fruit indeed, and their culinary history can be traced back to Neolithic times, with “subfossils” found in the Jordan Valley dating all the way back to 9400 B.C. Some figs grow from branches, but tropical species of fig grow directly out of the tree-trunk. The most fascinating thing about figs is that they are actually inverted flowers. The flower grows into the fruit and blooms within itself, forming the hundreds of tiny, delicious seeds we harvest them for. They are harvested after they are slightly dry and wrinkled, indicating the inverted flowers have “bloomed”. No wonder this was one of the first fruits cultivated by people! Capers; you may have tried them in a delicious sauce or in a fish recipe, or maybe you’ve just seen them floating in a tiny jar of liquid. Believe it or not, though, these tiny green balls of flavor have been around in Mediterranean cuisine for over 4,000 years and counting. What most people don’t realize is that this mouthwatering condiment isn’t a fruit or vegetable of any kind, but the immature bud of a beautiful and delicate flower. 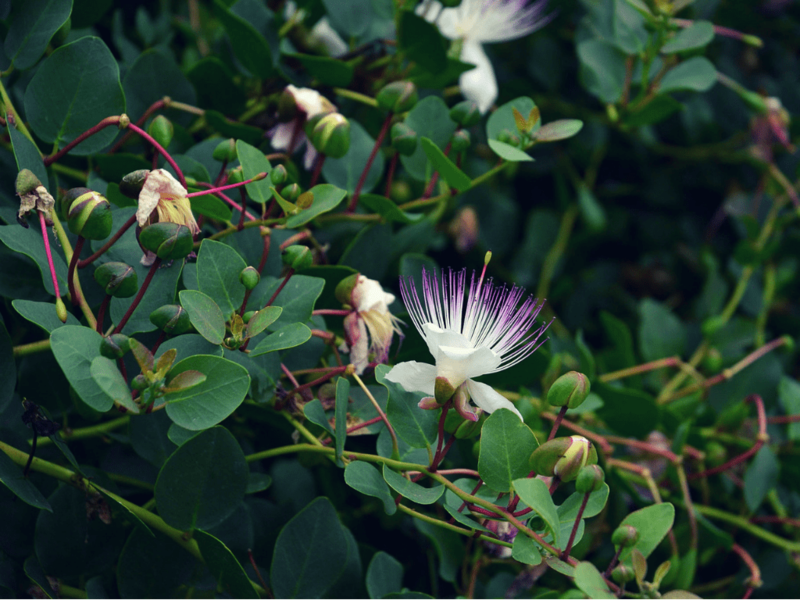 The flower of the Caper plants found blooming in walls and off terraces throughout Greece and the rest of the Mediterranean are so delicate, that these tiny little buds have to be hand-picked! Artichokes have also been a big part of the human diet for thousands of years. It’s use dates so far back that its Latin name, Cynara cardunculus, comes from a Greek myth involving Zeus punishing his lover Cynara for leaving Mt. Olympus to visit family by turning her into an artichoke. 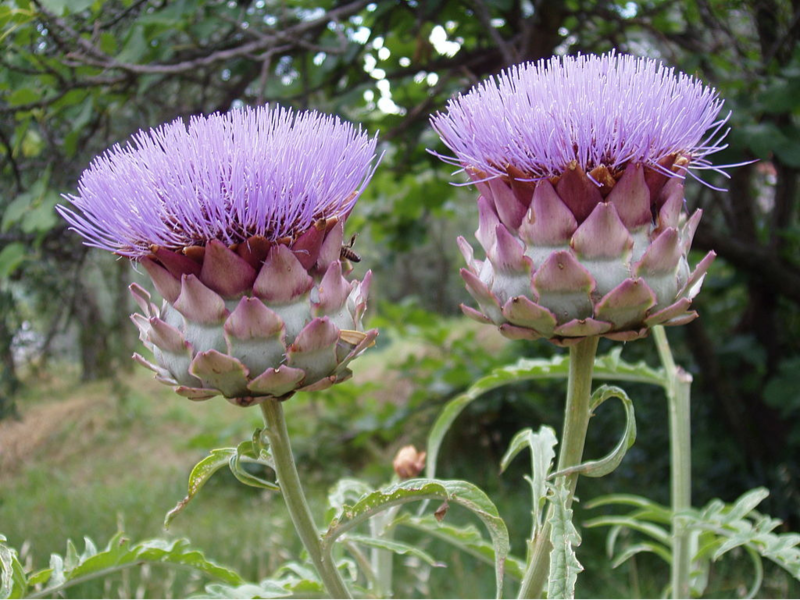 Artichokes are actually unopened flowers, like capers but much more massive in size, and are part of the milk thistle family. 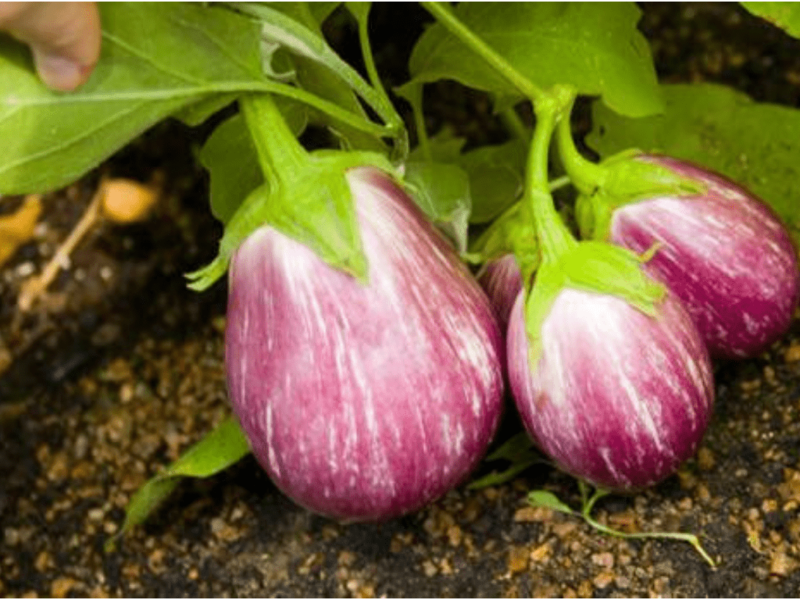 Eggplants are believed to have first come into cultivation in India aare cousins to tomatoes, as they both come from the nightshade family. One fun-fact about eggplants is that, just like tomatoes, it is commonly mistaken for a vegetable. In reality or botanical terms, eggplants are actually berries that tend to grow more like a bell pepper, low and close to the ground. 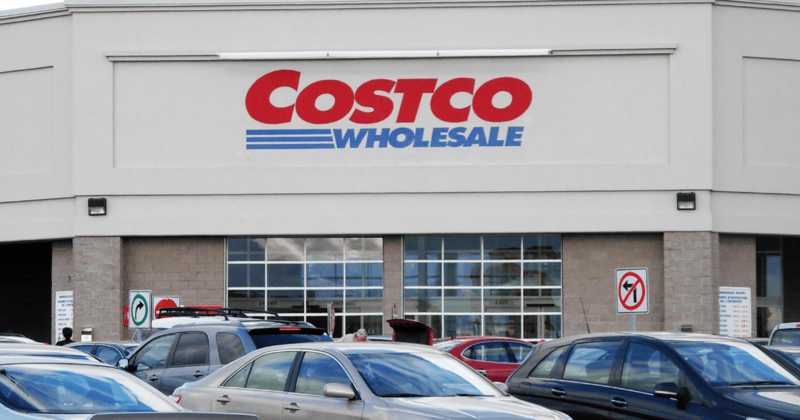 They have been soaking up the flavors of India and SE Asia for thousands of years, and are now common in every grocery store. Quinoa has been a favorite healthy alternative to brown rice dishes and oatmeal for years now. It is relatively high in protein and dietary fiber for a grain and keeps you feeling full for longer periods of time, making it a rockstar staple food if you’re trying to keep things healthy. These tiny, round balls don’t grow on grassy stalks like other grains though. 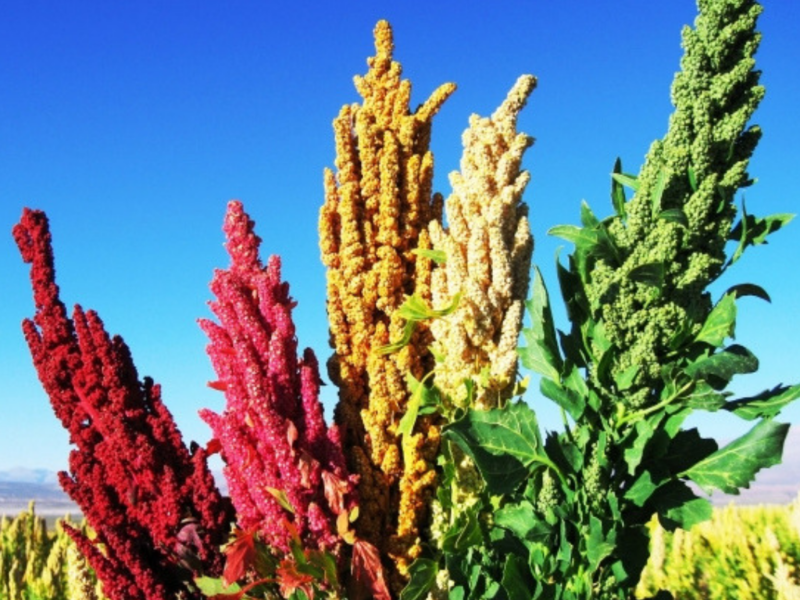 This is because quinoa technically isn’t a grain and is more closely related to beets and spinach, as it’s part of the amaranth family. It grows in clusters of thousands of seeds, covering the top half of the plant stalk and comes in many colors. This strange, exotic looking fruit catches a bad rep sometimes. Described only as a flavor you either love or hate, durian fruit has a custard-like texture and a very pungent smell. Some people love the smell and describe it as incredibly sweet, while others compare it to the stench of a sewer. 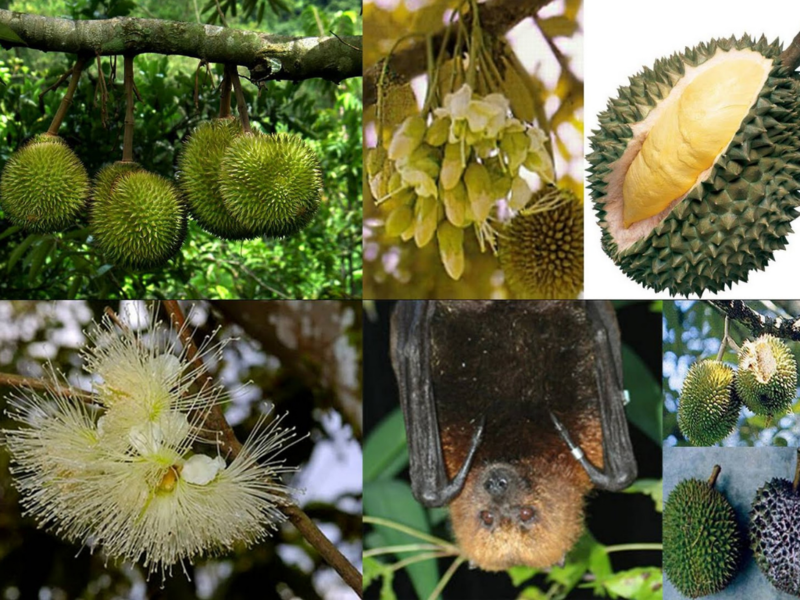 One thing is certain though; durians are a strange fruit! They grow in large husks that are up to a foot long, are covered in spikes, and grown directly from any branch, including the tree trunk itself. These fruit bat-pollinated trees can soar up to 164 feet tall, but will only thrive in tropical regions. This strange looking superfood is native to China and is touted for its many vitamins and minerals. 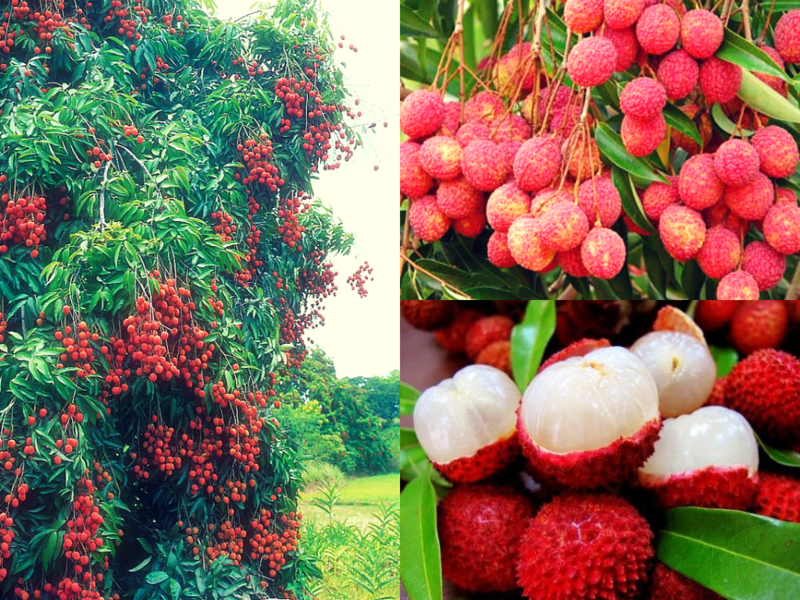 The lychee berries grow on evergreen shrubs, and while their outer exterior can be prickly and rough to the touch, they actually have a very thin skin that’s hiding a delectable jewel. Beneath the outer skin lies a juicy, white, fleshy berry that is described as having a mixed flavor of pears and grapes. 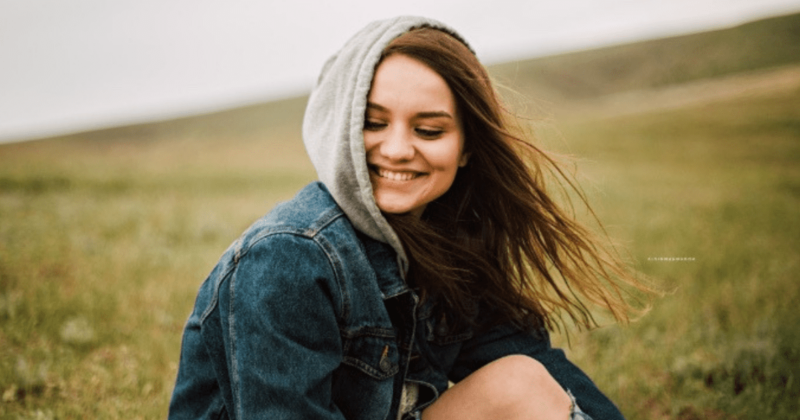 We’ve seen them in commercials and have probably even owned a Chia Pet a time or two, but not a lot of people are familiar with the full grown plant. The seeds are popular for not just their nutritional benefits, but for the mucilaginous effect as well. When soaked in water, chia seeds produce a thick, slimy liquid that is desirable in certain sauces and beverages as a thickening agent. 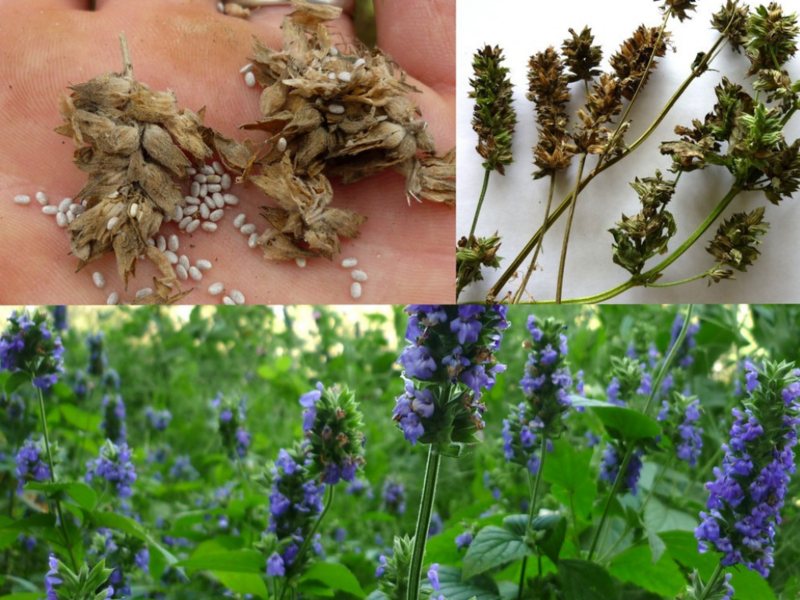 The itsy bitsy seeds of this plant come from the small dried husks of its gorgeous blue flowers that grow on stalks in tight clusters. Sesame seeds are one of the oldest foods known to man and have been farmed for human food for at least 4,000 years. It’s believed that it gained its early popularity from its extremely high oil content. 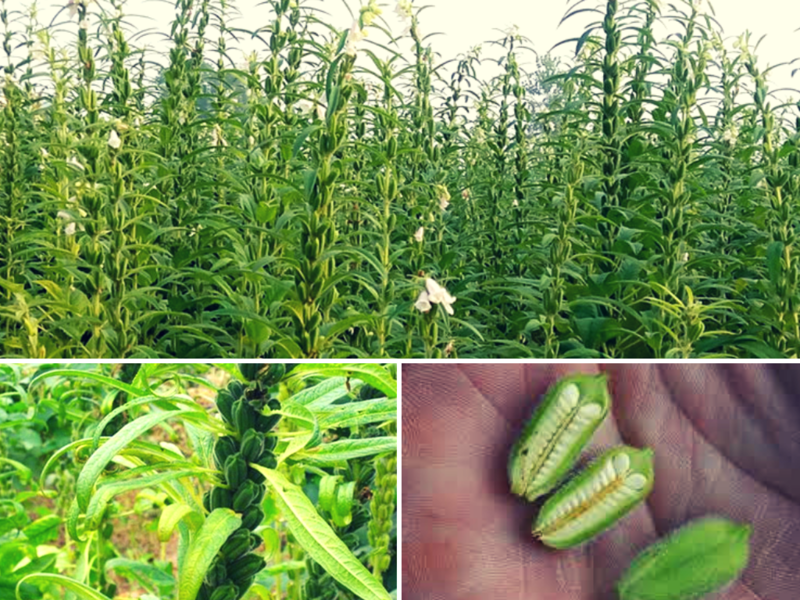 Hands down, sesame seeds have more oil than any other seed and can grow in desert conditions and nutrient-poor soil. These don’t come from the flower, but from the fuzzy “fruit” or pods that grown all up and down the stock. When the seeds are ready for harvest, the fruit pods crack open on their stalk to reveal the tiny powerhouse seeds. 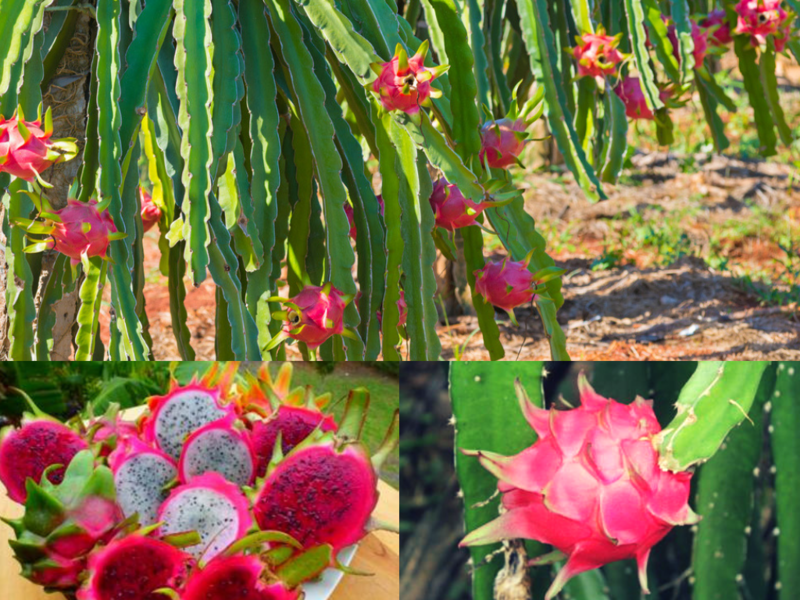 Dragon fruit has become increasingly popular over the last decade, and can now be found in most produce sections at the supermarket. We are used to seeing these large, waxy, brilliantly colored fruits at the store or as a flavoring in fruit beverages, but seeing them while they grow is something different altogether. Although they look like a fruit that would be hanging in the tropics like a gemstone from a tree, they are actually a cactus fruit and can be grown as a houseplant! 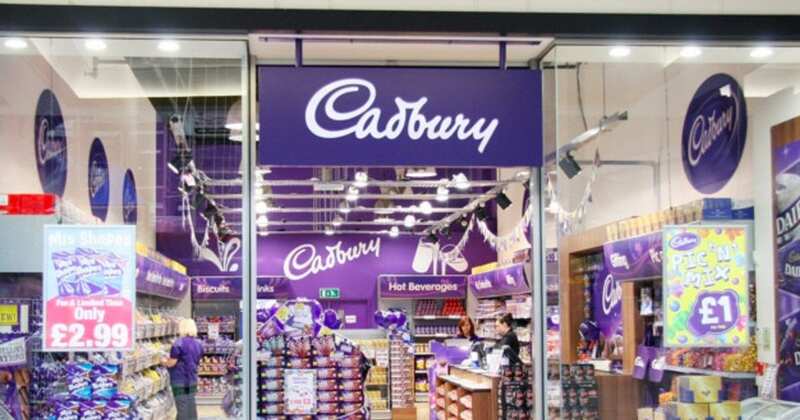 Just about everyone loves chocolate, but very few are familiar with how its main ingredient, Cacao, is grown. 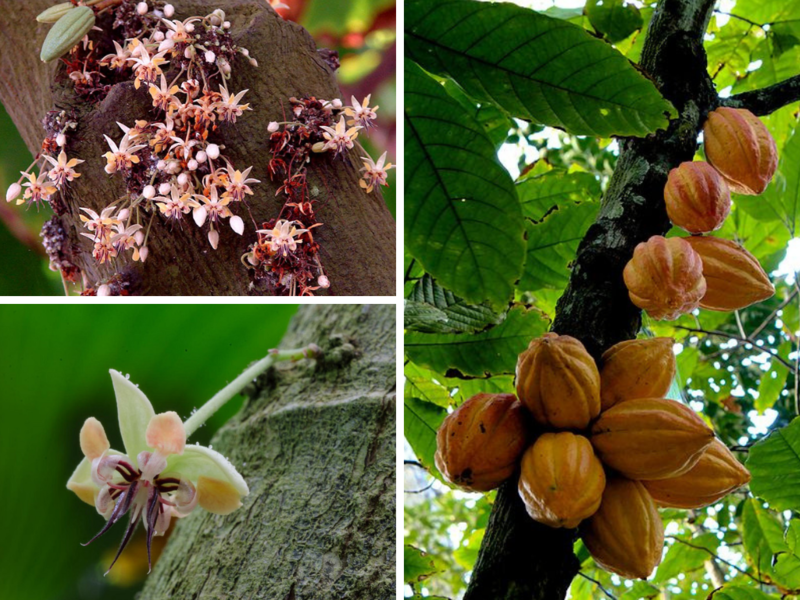 Also known as the Cocoa bean, these grow in large pods on tropical evergreen trees. The trees are equator-bound and only grow 20° to the North or South of it. The tree produces a beautiful flower directly from the trunk and large branches, followed by the pods that change colors as they mature. After they are ripe, the pod is cracked open and the seeds inside (usually around 40) are scraped out and allowed to ferment with their pulp still attached before they are dried and roasted. 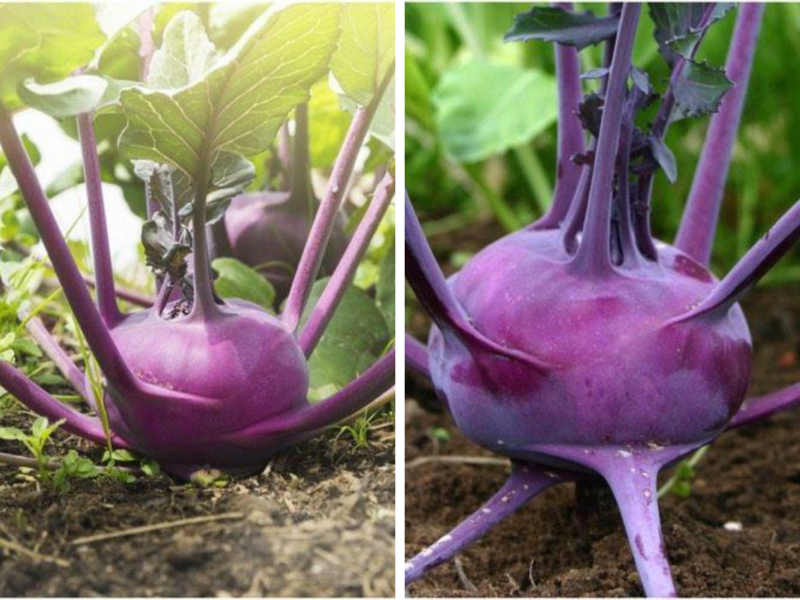 Commonly mistaken for a turnip, Kohlrabi is actually in the cabbage family and has a taste closer to broccoli. with a sweet twist. Also unlike turnips, the large bulb of a kohlrabi is actually a stem where a turnip’s bulb is the root of the plant, and it grows above the ground. These plants are not only a deliciously healthy addition to salads, soups, and smoothies, but they also make for gorgeous ornamental plants that can be grown in colder weather like kale! Pistachios have been a huge part of the human diet for over 8,000 years, and by now we’re pretty used to seeing them either in bulk bins or pretty packages at the grocery stores. These desert growing trees are a favorite of dry, arid regions where food can be scarce. They are packed with vital nutrients and fats and can grow in particularly salty soils. The trees can reach over 30 feet tall and can yield up to 50,000 nuts per harvest, which only happens every other year. The seed shell will change from green to fiery orange-red when ripe, and the shell pops open on the tree when ready for harvest. Okra is a favorite produce staple in southern American dishes like gumbo. While you might be used to seeing this slimy-but-tasty fruit in soups and stews, few know what it looks like before it gets there. 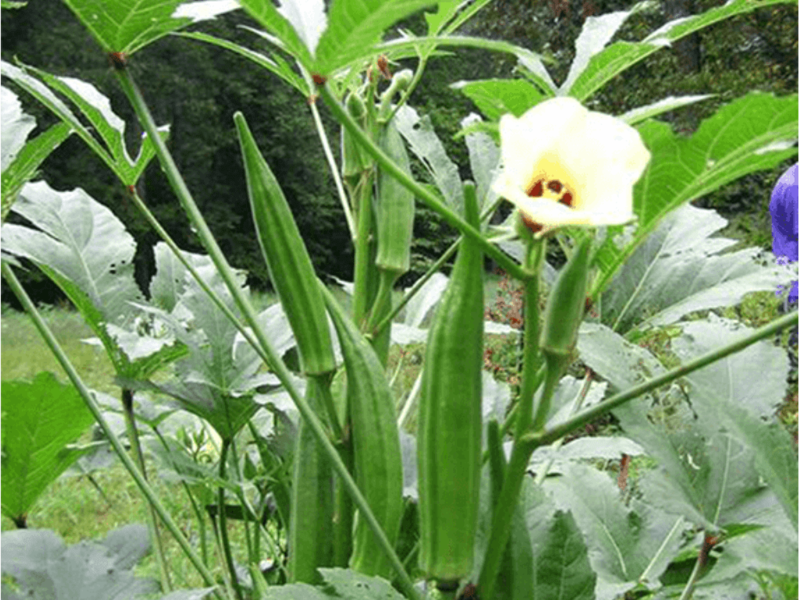 Also known as Lady Fingers, Okra grows elongated pods with deep ribs, creating a long five-sided fruit that curves upward and, indeed, resembles the long, slender fingers of a woman surrounding a showy flower. Flaxseed cultivation dates back to over 30,000 years ago to the Paleolithic period. So, it’s no great wonder you know the seeds on sight. Although we find these tiny seeds in a multitude of products, many of us have no idea what type of plant or flower they come from. 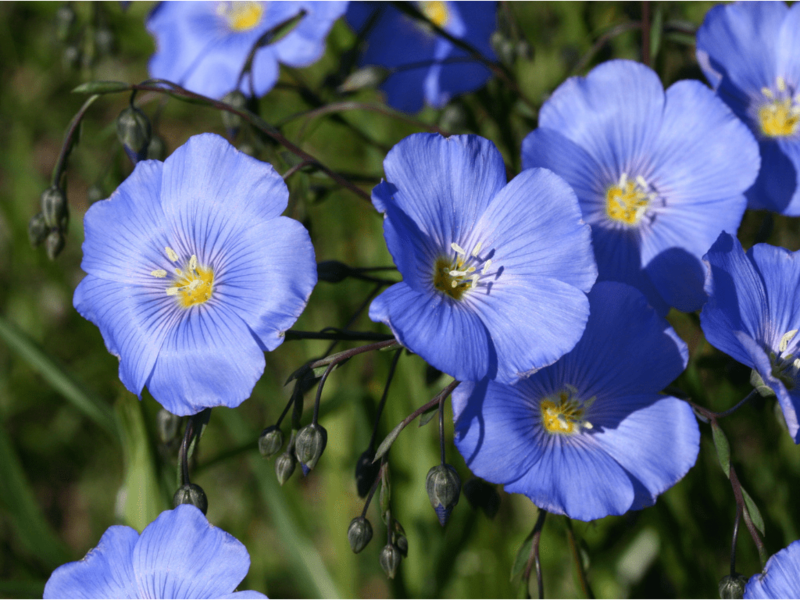 Flax is such a hardy plant, it has been cultivated in just about every temperate and cool region there is, including Russia. With beautiful blue flowers floating up to 4 feet in the air along thin and graceful stems, this international food staple is a welcome sight in any garden! These are just 30 out of the thousands of strange and unique foods that we buy by the ton each year! Who knew that our food is so unique and exotic-looking?! Please SHARE this with your friends and family, and let us know what your favorite “strange fruits” are!